Offers pond tours, contains information on the eco system, pond construction, kits, supplies and an on line store. Sells garden pond kits and pond supplies, including waterfall pumps, pond liner, pond care supplies, and pond decor. Offers a selection of backyard pond kits, pondless waterfall kits, patio ponds and Earth friendly water garden supplies. Offers pond kits, algae products, pond renovations, repairs and maintenance, and a demo pond. Provides a selection of koi pond pumps, UV lights, bio filters, pond heaters, pond supplies, and accessories. Offers a variety of pond and fish supplies, including wind powered pond aeration devices. Offers liner pond kits, pond lighting, aeration and heaters, pumps, filters, pictures of customers ponds, and an on line store. Offers a new filtering solution for crystal clear water in Koi and water gardens, pond supplies, Koi pond information, FAQs, and testimonials. Garden pond supply including barley straw and pond care for all backyard ponds. Offers a variety of pond heaters. Provides pond filters, skimmers and pond liners. Products for koi and pond. Name brand filters, pumps, pond kits, liners, UV sterilizers, filter media, and accessories at discount prices. Offers Japanese Koi, pond and water garden supplies. Includes FAQs, tips, a forum, and articles. Offers a Koi accessory called LymnoZyme to prevent disease. Provides pond design, installation and pond supplies. Offering a variety of tropic and temperate waterlilies, bog plants, irises, lotus, and cannas, with some varieties hybridized by the seller. Pond supplies, planting guides and a newsletter are available. Offers pumps, heat exchangers, UVs, fish medicines, fish food, water treatments and pond liners. Pond construction kits incorporating a surface skimmer housing a pump that supplies a biological/mechanical filter producing a balanced ecosystem for a low maintenance clear water pond. Pond plants, fountains, pumps, fish food, plant food, watergardening books and other related pond supplies. Handmade copper and bronze waterfalls, fountains, and birdfeeders. Offers thousands of pond supplies for all types of ponds and water gardens, from pond liner, pumps and filters to ultraviolet sterilizers, fish foods and aquatic plants. Includes moving waterfall pictures, tie dye apparel, tapestries, window gels, and Zippos. Products for building and maintaining a pond or water garden. Information and instruction for water gardeners and pond keepers. Birdbath products, including misters, drippers, creeks, and waterfall rocks. Also offers suet woodpecker feeders. If the business hours of Exotic Waterscapes.com in may vary on holidays like Valentine’s Day, Washington’s Birthday, St. Patrick’s Day, Easter, Easter eve and Mother’s day. We display standard opening hours and price ranges in our profile site. We recommend to check out exoticwaterscapes.com for further information. 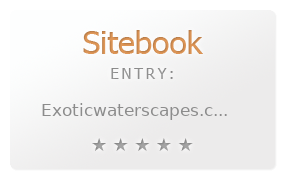 You can also search for Alternatives for exoticwaterscapes.com on our Review Site Sitebook.org All trademarks are the property of their respective owners. If we should delete this entry, please send us a short E-Mail.